Battery powered, 4 D cells last about a year. The Acroprint Model 125 can handle hundreds of print registrations per day. These dependable workhorses are suitable for any size business in any environment. Dust, Humidity, Heat or Cold: Bring It On! Accurate and dependable — designed to provide years of trouble-free service. Carries a lifetime typewheel guarantee, and 1-year warranty for the rest of the materials. There are two on the market that do this, this is the best of the two. Battery (4D cells) lasts for a year, then “beeps!“ to tell you it's running down. Survives in all environments, it will not rust. It comes as Dayof week, standard time. 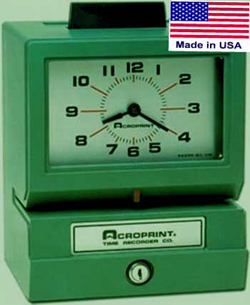 The Model BP125 manual-print time recorder accepts standard time cards. A push bar located on top of clock activates a sturdy spring print mechanism for instant registrations. This model comes with a large, easy-to-read clock face and a tough, rust-proof case.